Yesterday, and my legal obligation to visit Santa. Yesterday, we had the opportunity* to go and visit Santa Claus. But not at the mall or at a family Christmas party. Like normal people. 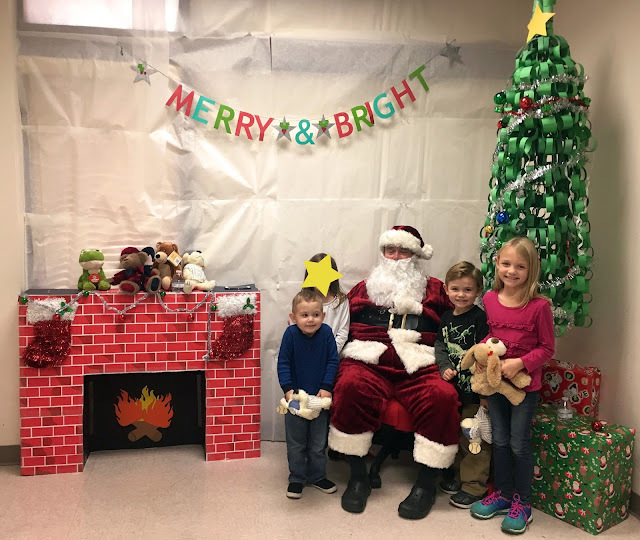 No no, we got to go see Santa at the social worker's office, because although the year is nearly done, the adoption we were assured would be finalized last summer is still in limbo. Quick aside for anyone not in the know: Our second oldest child joined our family through foster/adoption in August of 2015. Her biological family lost their rights in an unpleasant court proceeding over a year ago. This adoption is now uncontested. All of our paperwork and fingerprints and birth certificates and employment verifications and health physicals and left pinkie toes have been sent in, and we are ready to go. But we are not a high priority, and at this point, I'm hoping the adoption is finalized sometime before, say, our 6 year old turns 18. Fingers crossed. So yes, we are still In The System, and because of that, and because the social workers don't always enjoy making their monthly home visits, a few times a year they compel us all to come to them instead. In December for example, they make us go see Santa. Now, I really hate to say everything I'm going to say, because this is about a holiday event for sad little orphan babies. But the holiday event at the social workers office is the single most depressing part about Christmas. The holiday event shows up, and it's like "Heeeeeey Christmas party people! Remember Sad?" And you're like "Oooooh yeah.... Sad. I'd almost forgotten about Sad but here it is, suddenly clinging to my pant leg and spitting up on the floor." It's like that terrible Christmas Shoes song comes to life and wipes its snotty little sadness nose on your sleeve. That is pretty much exactly what it is like to attend the child welfare Christmas event. But if you don't really jive with my snotty-sleeve-wipe description, I'll walk you through a step-by-step of the whole experience. Upon arrival, you sign in, give the people your name, your assigned social worker, and write your reason for coming today. I put "Santa". I thought about putting "legal obligation so you don't yell at me again and take my kid away", but the box for your reason was quite small. So Santa won. After you've signed in, please feel free to have a seat in the Waiting Room of Sadness. The room is white but like, 20 years ago white, plus dirt and sad feelings. It has some chairs for grown ups and a small table and chairs for the tiny children of sadness. Eventually, your social worker shows up, frees another family from the festivities and takes you and the children back through a maze of cubicles, to the room where you first signed the papers stating you wanted this kid in the first place. But now the giant table in the middle of the room is covered with hundreds of printed Christmas coloring pages, and 15 broken crayons. I'm sorry. 15 broken colored wax sticks. They ask you to sign in again, this time with your name and the number of children you have, and then direct you to a table in the corner that has half-pint bottles of water, and plastic sandwich bags each filled with 2-3 store bought cookies. Then the kids go find a place to sit or stand around the giant table and see if they can secure themselves a coloring page and a crayon. Sorry. Wax Stick. And you go stand with your back against the wall because 1) there aren't nearly enough chairs, 2) there isn't nearly enough standing room, 3) having your back against the wall means people can only bump into you from one side, and 4) standing is better anyway. The room gets full. And the room gets hot. And it's better to have the elevation to breath above as much of the sadness as you can manage. There are also two television sets in this room, Wheeled in on those carts they used to use when you had a substitute teacher in elementary school and she was just hoping you'd stay relatively quiet until 3pm. The televisions are not on. One can only assume they are there exclusively to make the place feel homey. While you're there, you get to chatting with a woman who looks to be in her early 50s. She tells you her story, that she quit her job so she can adopt and raise 6 of her 7 grandchildren. You look around the room and realize this is almost exclusively the story of every single family in this room. Almost every new mommy was once that same baby's grandmommy. And you remember Sad. Then the lady's grand(son) comes over and won't stop punching you. After anywhere from 30-90 minutes (based on my personal experience), your name is called, and you and your children are escorted to the next room, which your child has been to hundreds of times before when visiting her biological family members, but today has been emptied of toys and decorated with a paper fireplace and Christmas tree. And let's be honest, you're a little bit impressed because it's cuter than it was last year. As you walk in, another festively dressed social worker brings a handful of gifts to the fake-bearded Santa who is seated next to the paper fireplace. He calls the name of your adoptive child because it's the only one he's been told. He hands her a wrapped gift, and to the rest he hands stuffed animals that, even though they still have their original tags, look like they've been left in someone's attic since 1993. You tell the kids to smile. You take a picture. As you leave, the social worker catches you to state that she's still not getting around to your adoption paperwork. But maybe next week. Except she's hoping to go on vacations. (She added that s, not me.) So maybe in January. But definitely... sometime. Also? Have a Merry Christmas. Last note. I gotta say, the kids seem to have a really good time. Except for all the waiting, and the fact that I don't let them go back for seconds on the cookies. Kids are mostly immune to sadness, it seems. The Weirdos and the fat man. Smiles for days. Also, sorry for the face-star, but it remains until the government checks the box saying we can keep her. Oh my heart. I'm so glad your kids are immune.